Want to set up an auto backup service to backup your iPhone/iPad, but don’t know how? Read on this guide to see how to automatically backup iPhone/iPad with 2 ways. AnyTrans is an all-in-one iOS data backup and transfer tool. It can not only help you automatically backup your iOS devices, but also supports selectively transferring data from iPhone to iPhone/iPad/computer. Nowadays more and more smartphone users asked for help on data recovery, as there are various reasons can lead to data loss on our device. To avoid important data losing, the best solution is to backup your device periodically. In this way, you can easily get lost data back even encountered terrible data loss problems. But since it may take lots of time and energy to handle this manually, plenty of users are looking for a way to backup iPhone/iPad automatically. If you are also one of them, then follow this guide to see how to automatically backup iPhone/iPad with 2 different ways. AnyTrans Air Backup feature takes over the painful yet vital backup job and keeps your iOS data safe. It provides you with the best and fastest way to backup your iPhone/iPad automatically. Now, let’s get more from it. Save effort and worry – It backs up your iPhone/iPad/iPod touch automatically, wirelessly and silently. You don’t need to do anything, or don’t even have to take your iPhone out of pocket. Set the backup schedule as you prefer – It enables you to freely set the backup schedule: daily, weekly, monthly or other time frame you prefer. And then, it will automatically back up your files as scheduled. 100% safe – It backs up your iPhone/iPad via your SSL-secured Wi-Fi. Private guaranteed – Your backups are stored locally on your hard disk. There’s no transition with Internet and no risk of being cracked. 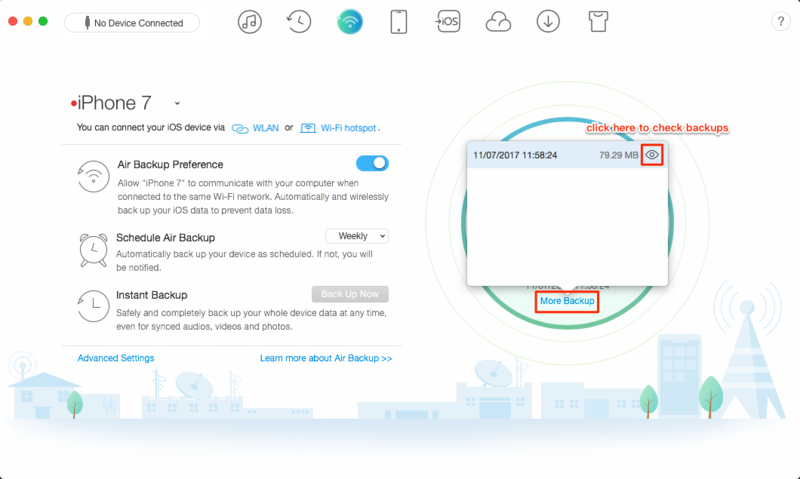 Full Control of your Backups – All the backups you created will be listed with device name, backup date, iOS version and more info. You can directly manage them as you want, such as preview, select, delete, extract, etc. Step 1. Download AnyTrans and install it on your computer > Lunch it > Connect your iPhone/iPad to the computer with USB cable (If it is the first time that you have used Air Backup function) > Choose Air Backup mode. Step 2. Disconnect your iPhone/iPad > Connect you device and computer to the same Wi-Fi network > Once your iOS device and computer are connected to the same Wi-Fi, it will back up your device automatically. You can change the time frame as you like. Step 3. 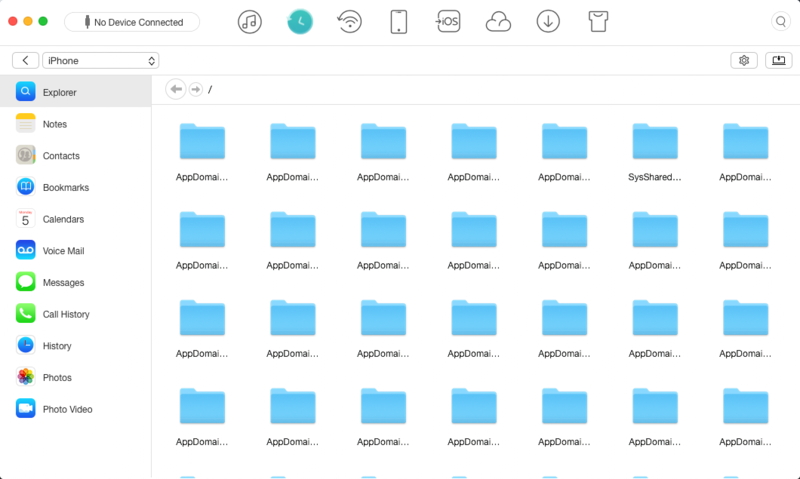 After the process completes, you can see the interface as the screenshot shows > Click on More Backup to check your backups. After clicking the View button, you will see all your backup files are listed here. You can click the file category to check the details. According to many iOS users reported, this way may take you a lot of time. And before the process, you must make sure that you have enough available space in iCloud. You just get 5GB of iCloud storage for free. If you need more iCloud storage, you will have to buy more from iCloud storage plans. Another method to backup your iPhone/iPad is using iCloud. 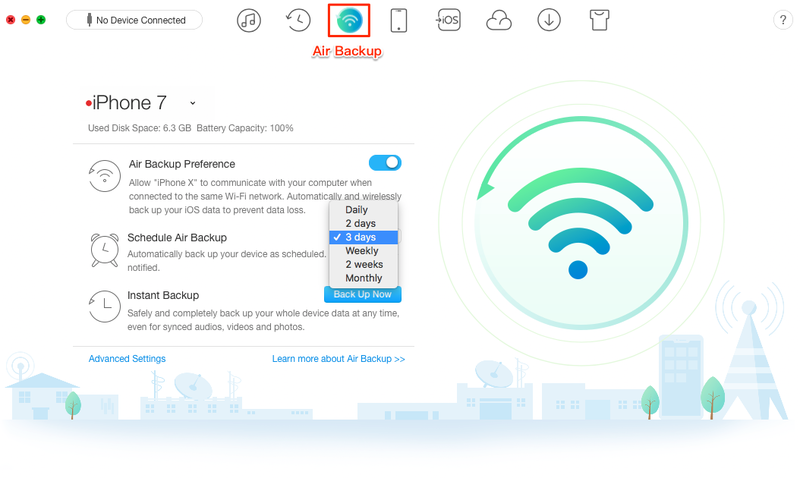 iCloud will automatically backup iPhone/iPad data under Wi-Fi when your iPhone or iPad is plugged in, locked and connected to Wi-Fi. Step 1. Go to Settings > [your name] > iCloud > Tap iCloud Backup > Turn on iCloud Backup. If you’re using iOS 10.2 or earlier, go to Settings > iCloud > Backup. Step 2. Connect your device to a power source and a stable Wi-Fi network > Lock your iPhone/iPad screen. If you have enough available iCloud space, it will back up automatically. Otherwise, the backup process will stop. Here are some differences between iTunes/iCloud Backup & Air Backup, check them and choose the one best suited to your needs. With above 2 ways, you can easily make an automatic backup on your iPhone/iPad. And as you can see, AnyTrans can be the most ideal choice for you to complete the job. So, don’t hesitate to give it a try now.